The Brown Lady Ghost Photo is the most famous picture of an alleged spirit in the world. 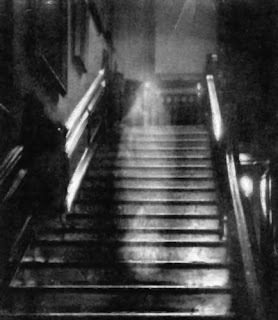 The Brown Lady of Raynham Hall is believed to be the ghost of Lady Dorothy Townshend, who was banished to the estate as punishment for her infidelity. Captain Provand and Indre Shira, photographers for Country Life, snapped this on September 19th, 1936. The photo above is widely considered one of the few reputable full body apparitions caught on film; while many mundane explanations for the image have been proffered, The Brown Lady Ghost Picture is not believed to have been any intentional hoax. Note: This picture was filtered slightly to improve the quality of the image. It was not otherwise altered.